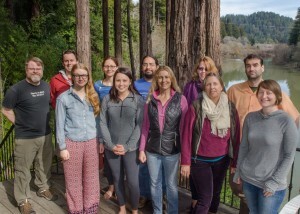 HRDAG on retreat, February 2016. What do you get when you bring seven statisticians, one quantitative political scientist, a writer, a computer scientist, and an administrator together for four days in a vacation rental on California’s Russian River? A lot of code, a technical paper and book chapter revised, another paper started, a great hike in the Redwoods, descriptions of food poisoning and crash landings in war zones, and a lot of talk about feelings. After the feelings, the opening meeting quickly moved on to plans for the retreat, and then people broke off in groups to discuss technical issues or prepare dinner. (We’d signed up in advance to prepare group meals.) But as the week progressed, feelings came up again, usually during group dinners, when Megan would again ask us to check in. And while it made me nervous, I realized the periodic gut-checks were good for me. On that first night, when we’d moved on from feelings to goals, I’d said that I had a chunk of code I needed to write, and I planned to make that the focus of my time there. Then, the next morning, Patrick Ball gave a talk on good coding practices that sent me into a mild panic. (My programming practices are largely centered around one goal: get this thing in front of me to work.) Afterwards, I looked through my project and realized I needed to reorganize, and in some cases rewrite, my code. And as I started thinking about how to organize what I’d already done, and how to map out what I wanted to do, I started to reconsider the structure of my dissertation. That reminded me of ideas for a new section that I’d wanted to discuss with Megan and Patrick, as it would involve using their data. They were excited, and so I started to outline that work. And I ended up spending two days doing mostly planning, organizing and outlining. It wasn’t what I’d planned to do, but it was what I needed to do. And the nightly check-ins helped me notice that I was accomplishing something. In some ways, my progress was an example of what the retreat aims to accomplish. HRDAG has a staff of 4, including one who is remote and another who is part-time, a network of consultants around the country, and a few international collaborators. Most of the group’s communication happens over email and Skype. This works well most of the time, but getting people together for a few intense days every year results in a pretty reliable productivity bump. Conversations happen, sometimes late and over wine. People review each other’s code and read each other’s drafts. While I was there, three people put finishing touches on a paper they’d been developing over the past year, and one of them finished an R package as well. Much of the work was technical, but not all. HRDAG researchers are geeks by definition, but they’re drawn to problems for substantive reasons. Historically, programs have focused on quantifying the direct effects of war, but new projects will look at prison populations and police actions. In the end, I failed to accomplish my original goal, but I did finish something equally important, a plan that will streamline the rest of my dissertation work. (I’m assessing data on child kidnappings during El Salvador’s civil war and patterns in death reporting in Syria.) That was something I hadn’t realized I needed to do until I saw Patrick’s talk and had a chance to reflect on the bottlenecks in my own work. I also had some more immediate successes: I talked through code problems with a real programmer and got access to some important data. And I enjoyed hearing about other people’s work – and feelings, too. As the new kid on the block, I was inspired by the number of people working on related problems. I was also reassured that I wasn’t the only one who found the work challenging.